In January 2006, US writer friend Tom Minter sent Joan Lane the stage play script of THE KING'S SPEECH. As a fellow writer and friend of the play’s author David Seidler, Tom recommended Joan as a well-connected London-based theatre producer. Having previously sent the play to another London based colleague, who had not been able to attract interest in it, David was unsure as to what he should do next - so he followed Tom’s advice. Joan loved the script and became David Seidler's agent, working hard to promote THE KING'S SPEECH and another of his plays until January 2010. She had originally trained and practised as a Speech and Language Therapist (at her family’s behest, as they did not wish her to follow in the footsteps of her parents and grandparents by working in theatre); and she was already conversant with the story behind THE KING’S SPEECH. HM Queen Elizabeth the Queen Mother was Patron of the College of Speech and Language Therapists at that time. As a young graduate, Lane had organised a charity ball which raised sufficient money for the College of Speech and Language Therapists to put down as a deposit for their own premises. As a result, she was presented to HM Queen Elizabeth the Queen Mother at St. James's Palace for the first time. She eventually ceased working as a Speech Therapist (having worked with stammerers amongst other patients) and followed her heart into the worlds of music and theatre. Along the way, she was introduced to Major Sir Michael Parker and joined his production team for official state events (e.g. VE Day Celebrations, VJ Day Commemoration etc) and was on the production team as assistant director for HM Queen Elizabeth the Queen Mother's official 100th birthday celebrations on Horse Guards parade. She met the Queen Mother several times during this period. 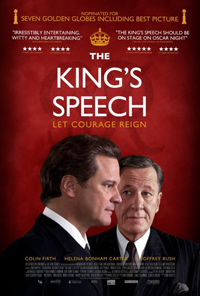 Following lack of interest in the stage script, with straight rejection from some major producers and theatres, and seeing THE KING’S SPEECH not just as a stage play, but also as a potential film…..
Lane gave a copy of the script to Simon Egan at Bedlam Productions for his view on it. Simon loved the script, saw the potential as she had done, and Bedlam took an Option on a screenplay adaptation. Knowing Lane was doing a rehearsed reading of the stage play at the Pleasance Theatre in Islington, Simon asked if he might film the reading in order to put together a promo video to try and sell THE KINGS SPEECH as a potential film for TV - and possibly for cinema. Lane permitted the recording to take place; and a promo DVD was made of the rehearsed reading. Amongst the guests invited to that rehearsed reading, were the parents of director Tom Hooper. They had been invited as part of Lane’s "Australian contingent" of friends and colleagues. At the end of the reading, the Hoopers expressed their enjoyment and great enthusiasm for the play; and Lane introduced them to David Seidler (the play’s author). She then encouraged David Seidler to exchange contact details with Tom’s father, and through him, with Tom; and a script of THE KING’S SPEECH was sent to Tom for his consideration. Following the rehearsed reading, Lane persuaded her former Australian neighbour Elspeth McCracken-Hewson (who had returned to Melbourne and now lives fairly near to Geoffrey Rush) to put information on the stage play through Geoffrey Rush’s door. The package wouldn’t fit in the mail box, so Elspeth left it on his doorstep! Lane was hoping to get sufficient interest from him for a stage production; and attached a letter apologising for her unorthodox approach. Despite the lack of protocol, Geoffrey’s manager got back to Lane within hours with a most pleasant email to confirm interest in the project. Lane then forwarded a script to Melbourne and received a second enthusiastic email from his management. Lane has subsequently had a friendly email exchange with Geoffrey. With this unorthodox approach to Geoffrey Rush, Lane simply took a punt. She had received rejections from major production companies and theatres and was well prepared for yet another rejection - but instead, she received a positive response. Geoffrey Rush’s attachment to THE KING’S SPEECH, coupled with Tom Hooper’s interest following his parents’ enthusiasm for the play, propelled the project forward. Telling Simon Egan that Geoffrey was interested in a film version of THE KINGS SPEECH, Lane then handed over to Bedlam Productions the job of harnessing him to the venture. Geoffrey’s preference was for a film version of THE KING’S SPEECH rather than for the stage play as he was about to appear in the highly acclaimed EXIT THE KING on Broadway. Bedlam then required finance to further develop the project; and Lane was able to introduce Simon and his partner Gareth Unwin to one of her colleagues over a lunch at BAFTA. And development money was forthcoming. Simon and Gareth (Bedlam Productions) joined forces with See Saw Films as co-producer; and the rest is history - with the two companies "selling" the project to Harvey Weinstein and Momentum. The success of THE KING’S SPEECH is partially due to the fact that despite early rejections of the script, Lane did not give up. In committing an audacious act in order to attract Geoffrey Rush’s interest, by working tirelessly on behalf of the project, introducing the author to many people in the entertainment industry and promoting both him and THE KING'S SPEECH here, there and everywhere, the foundations were laid for this great British success story. Effectively, Lane "green lit" the film and gave the best possible kick-start to a magnificent production.